Yesterday after church I was lounging on the couch–something I excel at–and the movie Argo was on television. I was kind of mindlessly watching, because I’ve seen the movie before. But in one of the scenes the main character, played Ben Affleck, slams down a phone in anger and frustration. For some reason that sound of the phone’s plastic clashing with the base triggered a forgotten memory, a forgotten sound. That sound, and the emotion that goes with it, has become extinct. It is impossible to slam a smart phone down in anger with the same effect, and even if you could, it would only be expensive to replace it. As we grow older we find that not only does landscape, vocabulary and fashion change, but so to do the things we hear. I made a little list of the sounds that have disappeared during my lifetime. When I think about them, they sound like childhood. the national anthem playing when the television station ‘signs off’ at the end of the broadcast day. I am sure there are many more, but these are the ones that came to mind. Let me be clear, it is not that I miss these sounds, because I don’t really miss them at all. I’ll take my smart phone over the party-line any day. 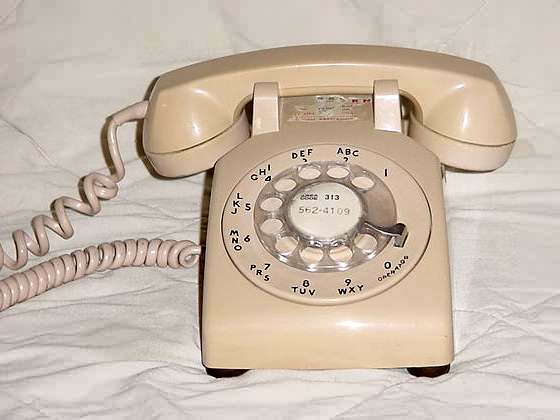 The point is, perhaps, when I think about a phone, my mental image is still the plastic rotary phone and the way we handled them, carried them around while talking, and then ‘hung them up’ when we were finished. I wonder, when my sprouts are my age, what sounds that are a part of my everyday life will no longer exist? wow terry lee–that is amazing! do you use it, or is it in a spare bedroom or the garage or something?